Concord unveils a double retrograde complication that combines the date and day of the week, in a world in which engineering and design battle for precedence. Cut from platinum or rose gold, the C1 Biretrograde leaves nothing to chance. 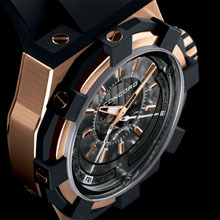 Exploiting the brand’s emblematic construction concept, it offers a bold and contemporary display of time. The model boasts an imposing case that combines various materials and a transparent multi-layered dial: the time mechanism is displayed below 3.3 mm of sapphire crystal, remaining perfectly legible. The chapter ring, which is slightly off-centered to provide space for the retrograde displays, sits on a sapphire-crystal disk above the gear trains. The play on transparency is broken at 12 o’clock by a decisive opening that reveals the balance. Solidly constructed from platinum or gold and flanked by luminescent appliqué hour-markers, the hours and minutes hands float above the caliber’s somber frame. 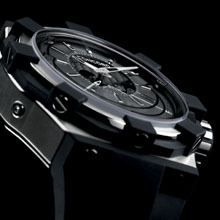 The structure is strengthened by three screws, which add to the personality of the timepiece. The retrograde date and day indicators, positioned at 4 and 7 o’clock respectively, trace perfectly symmetrical arcs. Their streamlined, almost industrial hands reinforce the watch’s ultra-contemporary style. Besides their design, these displays are also undeniably complex for ultimate precision: the hands instantly return from one end of the arc to the other in less than one tenth of a second. Furthermore, its cam system is clearly visible. The energy transmitted to the movement relies on a sophisticated spring mechanism, which combines strength, precision and lightness for maximum reliability. The layered construction of the dial draws on depth of vision to highlight the gears. The contrasting effects of light and shadow, together with the finishes – black chemical treatment, circular-grained or Côtes de Genève decor, matt or glossy polish, etc – give substance to the time display. The precious metal case also remains faithful to the brand’s DNA: sturdy enough to withstand the toughest conditions, with a protective rubber-coated ring screwed laterally and a dense sapphire crystal featuring antiglare treatment. The alternation of rubber/rose-gold or platinum materials reinforces the high-tech nature of this timepiece. 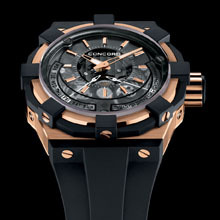 Not to mention the strap, whose hornless design guarantees a perfect adjustment to the wrist. Skeletonized to reveal the movement decorated with Côtes de Genève, circular graining and black PVD treatment. Markers & hands with superluminova treatment. Black vulcanized rubber with folding clasp in 18 carat gold.